I just had lunch with a friend and colleague who is currently on terminal leave. He has climbed out of the cockpit for the last time and now he is knee deep in the job hunt. We had a great conversation about the highs and lows of transition, and it brought out one aspect of the journey from being a uniformed killer to a suit-wearing civilian: it takes time. Lots and lots of time. And, to reach a happy destination at the end of that journey, it requires patience. Patience to work through the Veterans Administration’s bureaucracy for things like the GI Bill, medical examinations, and the excruciatingly long disability claims process. Patience to find out what you want to do with the rest of your life. Once you take your uniform cap off for the last time something happens to your brain, and suddenly the things that you thought would be easy (like getting a sweet job, going back to college, moving back home) are dauntingly hard. So this is a quick post on the importance of patience. Even though the trials and tribulations of your transition are unique to you, there are tens of thousands of people just like you going through the same thing. Those who are the most successful are those who are patient. A smart person once said that with patience comes wisdom, and that person was right. A certain way to be unhappy is to jump on the first job that comes your way, because it most likely is not what you really want to do. Following the quick and easy path to a college or school with a dubious reputation will result in your GI Bill benefits being flushed down the proverbial toilet because once they are gone you can never get them back and use them at a more reputable university that takes a little work to get into. Patience is a virtue, even though it is very painful at times. So stick it out, hold to your goals and dreams, and keep moving towards them. Don’t give up and take the easier path — you’ll regret it later. 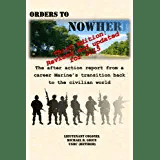 This entry was posted in Military Transition, Transition Posts and tagged active duty, career, military, Military Transition, Retirement, Terminal Leave, transition, VA, Veteran, Veterans Administration. Bookmark the permalink. Early retirement from the Marine Corps — are you eligible?